Classic flannel goes fashion-forward with unbelievable softness and a fresh fit. 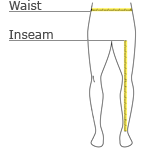 Measure waist at the height pants are normally worn, and keep tape comfortably loose. Measure a similar style pant that fits well and is the desired length. Measure from the crotch seam to the hem.